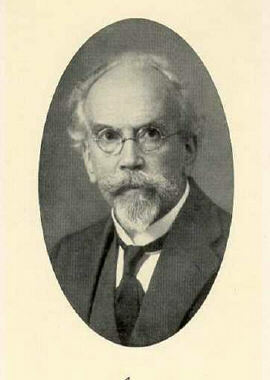 German ophthalmologist, born 24th June 1867, Smyrna, Asia Minor; died 29th July, 1930, Freiburg im Breisgau. Axenfeld's syndrome = A syndrome characterised by posterior corneal embryotoxon, prominent Schwalbe's line and iris adhesion to the Schwalbe’s line. Karl Theodor Paul Polykarpus Axenfeld was the son of a German preacher of the consulate in Smyrna. he was still a child when the family returned to Godesberg, Germany. He first attended the Unievrsity of Bonn and then studied medicine at the universities in Marburg and Berlin, reciving his medical doctorate at Marburg in 1890. He was habilitated in 1895, while working in the Marburg eye clinic. The following year he became Wilhelm Uhthoff's (1853-1927) assistant in Breslau, but already in 1897 he accepted an invitation to become professor and director of the university ophthalmological clinic in Rostock. In 1901 he assumed the chair of ophthalmology in Freiburg im Breisgau, where he worked until his death in 1930. Axenfeld maintained his acute intellectual facilities until the end of his career. He became unwell after a brief academic visit to Japan and, following an abdominal operation in Freiburg, he died on July 29, 1930 at the age of 64 years. In 1902 Axenfeld published a monograph on trachoma, and this was followed by numerous articles on tuberculosis of the eye. By 1907 he published a book on ophthalmological bacteriology and in 1909 his Textbook of Ophthalmology, which became the standard work in its field. In addition to his books Axenfeld was the author or co-author of almost 200 medical articles. Beiträge zur Aetiologie der Bindehautentzündingen. Ueber chronische Diplobacillenconjunctivitis.